Seven Asian and European auto makers have just opened, or will open shortly, new Mexican assembly plants, reports The Wall Street Journal (March 18, 2015). Others have made significant expansions in Mexico, among them Nissan, GM, Ford and Fiat Chrysler. This month, VW said it would spend $1 billion expanding a Mexican plant to build a small SUV for the U.S. and foreign markets. All told, auto makers and parts suppliers have earmarked more than $20 billion of new investments. 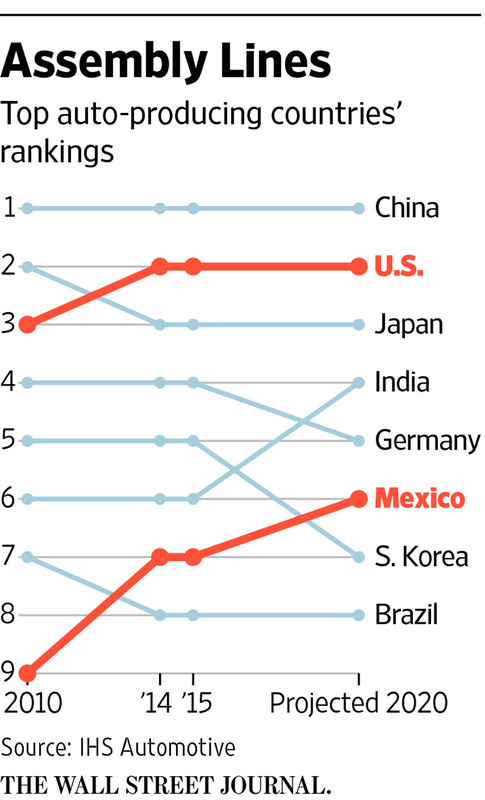 The wave of investment has turned Mexico into the world’s 7th-largest producer of cars—it passed Brazil last year—and the 4th-largest exporter after Germany, Japan and South Korea. Mexico’s current production of 3.2 million cars and trucks will rise more than 50% to 5 million by 2018. It has been more than six years since an auto maker picked the U.S. South for a “greenfield” plant, meaning one where the company didn’t already have facilities. Such projects have all gone to Mexico lately. Audi is taking some unusual steps to control its risk. First, to ensure quality, the company created a consultancy that fanned out to 160 parts suppliers in Mexico, encouraging some to change plant design or improve weak production processes. The company created an inventory of local sources for every part and for all raw materials used in the Q5, and has required suppliers to source from its list. And Audi now is training 600 people from Mexico at its headquarters in Germany. Visiting on 18-month stints, the Mexicans train on Audi systems and are indoctrinated with the company’s intense focus on quality.